Secretary of Defense Ash Carter is considering recommendations for a major reorganization of the Defense Department that would make U.S. Cyber Command a full combatant command similar to the U.S. European Command or the U.S. Special Operations Command. Among the main considerations for raising the profile of Cybercom is the trans-regional nature of emerging threats, like terrorism, and the increasing use of cyberspace as a main warfighting domain. According to Carter, Cyber Command has been assigned the mission of disrupting ISIL’s command and control networks, interrupting the terrorist group’s ability to plot attacks, and disrupting its financial networks. “All of that we can approach, in part, through cyber,” Carter said. Talk of adjusting the Pentagon’s organization comes six months after Carter ordered a departmentwide review of organizational efficiency by the Defense Department’s deputy chief management officer and a senior officer on the Joint Staff. Carter’s direction was to identify any areas of redundancy, inefficiency, or possible improvement to the Pentagon’s ability to manage emerging crises and shift forces when needed. The Defense Department currently operates six regional combatant commands: Pacific Command, European Command, Africa Command, Central Command, Southern Command, and Northern Command. It also operates three functional commands, including SOCOM, Strategic Command, and Transportation Command. In the current fight against ISIL, Cyber Command plays a supporting role to U.S. Central Command–the geographic combatant command responsible for Iraq, Syria, and a large swath of Southwest Asia. The challenge, Carter said, is that cyber cuts across most emerging threats and conflicts, as well as all of the six regional combatant commands and the three functional commands, like SOCOM. “We’re increasingly finding the problem not just of regional integration but of regional functional integration. The world has gotten more integrated, so we have to get more integrated too,” said Carter. Cyber Command, located alongside the National Security Agency at Fort Meade, Md., is currently considered a sub-unified command under U.S. Strategic Command. 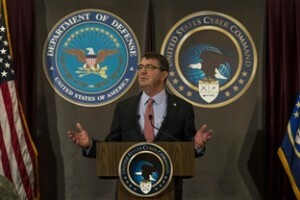 About 963 civilian and military personnel are assigned to Cyber Command, which manages a budget of about $466 million. To date, the command has 27 fully operational Cyber Mission Force teams and plans to field a total of 133 teams by 2018. Some have questioned Cybercom’s progress and maturity to be able to take on the responsibility of a major combatant command. The question was put directly to Adm. Michael Rogers, the commander of Cybercom who also serves as director of NSA, during a Senate Armed Services Committee hearing Tuesday.